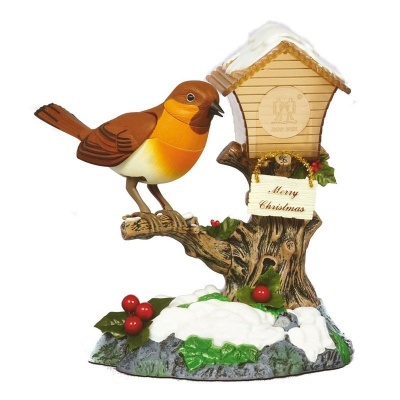 Premier Singing Robin on Bird House - Battery Operated novelty Christmas ornament sings a joyful chorus of 'We Wish You A Merry Christmas' with animated features. Add festive fun to any home at Christmas, when this unsuspecting shelf ornament begins to sing to seasonal visitors when sound activated. Winter Robin sits on perch and animates Wings, Tail And Beak whilst whistling the festive song, meanwhile the bird house flashes with various colours.